Register Log In Primarily Petroliana Shop Talk Forums General Petroliana Discussion Where do you see the hobby going in future years? Just awhile back I was talking to a friend that attends a lot of local auctions that on several occasions the (kids ) 40 years and younger have no interest in grandpa or dads stuff and only want the money . So sad . But I have also stopped and thought out of all my friends and people I know my age ( 42 ) how many collect this stuff or even have a interest in it . Not many , so it's kind of holding true. I had another collector friend tell me once he remembered when the old dark green electric pole insulators would fetch $ 10-20. Now no one hardly buys them . I will do as others have mentioned buy what I can afford and just enjoy it . I think Dave's jukebox comparison is proof as well . I don't even go to auctions anymore as you can't buy anything . Sooner or later I think it will slow down or I hope ... I have to many item I want lol. I'm 28 so maybe lend a younger perspective. I see myself always owning at least two station signs for the next 40 years. And I look forward to buying some cool stuff on the cheap, cause I would be absolutely shocked if prices (real) don't drop. We're soon in a world of self driving cars, renewable resources, and people not owning cars but using ride sharing. This means less love & attachment to automobiles and certainly servicing the automobile that they don't own. 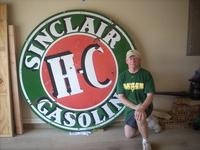 I've had many people come through my condo ignoring my glorious sinclair/texaco/red crown/humble/.... signage. Very few comments or appreciation for the history and value. It's a shame cause I love it. I love this stuff. But it has gotten way to rich for my blood. I have not made a purchase for almost two years. Everything goes in cycles including anything collectable. So Ii think the prices will drop a tad bit in the near future so that entery level collectors like myself can get back in the game. Then it will fall slowly year to year until the young generation are the only ones left. And they will just toss it in the trash! I hope I am wrong. This is an interesting conversation so I figured I throw out my 2-cents as well. I’m 53 yrs old and I can remember from the time I was a young kid that the vintage signs were always cool to me along with the old corvettes, Camero’s etc. I had bought a few reproduction signs from hobby lobby in recent years but it wasn’t until last summer that I thought I might by a few real ones. This website was one of the first I ran across and I made my first post asking if anyone had a mobilgas pump plate I could buy. It didn’t take long before a long time collector replied and shortly after that I met him. He shared his massive collection with me and it just confirmed to me how cool this stuff really is. He told me to only buy quality and I’ve heard others say the same. Well I ended up buying 2 plates from him that day and i made the comment at the time that this would be like buying crack in a joking way. Fortunately I work for an airline (not with a pilot salary though..ha) so I flew to Iowa gas from Texas shortly after that and again this year and it’s awesome and I was surprised to see some of the signs like mine selling for more than I paid. That’s great but I buy them because I love them and I don’t go crazy, but I try to buy quality and I know they will have some value down the road, I hope more but if not I’m 100% good with it either way because I love them. My friends think they look cool but they won’t spend the money and my girlfriend thinks I’m crazy. Doesn’t matter to me I love the history of these old companies and I find myself wanting to learn more and more. I enjoy it and look forward to hopefully getting out to Dixie Gas for a day next week and maybe Hershey in October. I know it’s risky with the reproductions out there but if you use the resources out there on this website and some of the FB groups and other sites and more importantly meet you guys and learn from you, hopefully I won’t make too many big mistakes. I think there will always be some value in the quality signs and the history that goes with them but keep it fun and enjoy the stories and there are still so many cool signs to see so enjoy the adventure. I now have 14 signs and probably will buy a few more. Whether you have $200 or $20,000 or $200,000 to spend, there’s a collection for you to build and enjoy so make the most of it and only time will tell if anyone else shares our passion down the road and what they might pay. It’s a blast so thank you all for your great posts on this website and elsewhere and thanks for sharing your collections and experience with the newer collectors. Last edited by bmxpro1; Thu Aug 30 2018 09:04 PM. I went through all the conversations to be sure this has not been mentioned. My question is “How has the History Channel’s American Pickers affected buying, selling, and collecting of Petrolina and the rise and potential fall of prices? My question is “How has the History Channel’s American Pickers affected buying, selling, and collecting of Petrolina and the rise and potential fall of prices? I believe it has affected the hobby in a big way. Sign values have skyrocketed. It has probably made a lot of would be sellers reluctant to let their stuff go. Vince, That was a well thought comment you wrote. You will enjoy this hobby immensely for years to come with that great approach. I have been a car guy all my life so it seems kind of natural that I would be interested in gas station related items, particularly (for me) old pumps. I also agree with many of you that think prices will eventually hit a peak and drop back. There was a time when visible pumps were heavily sought after but the demand seems to have dropped off and prices for the more common models seem to have come down some. Now the demand for clock face pumps is high but this is sure to diminish as well. I also believe that at some point demand for the lowly pumps from the 60's and 70's will increase as owners of muscle cars from that era try to "accessorize" their collection. I don't think these pumps will ever demand the prices we are seeing today for the older pumps but I more often wrong than right. It is important to remember that there are a very large number of car enthusiasts out there and this alone suggests that the stuff we collect will remain collectible for a long time to come. Let me conclude by saying that I collect because I love this stuff and if the price of pumps comes down than that only means I can afford more for my collection. Now the price for signs is another story and one, I will admit, I simply do not understand. I think prices will decline just like so many other items from the recent past (bicycles, soda machines, etc.). Every time I go to car shows and swap meets I am by far the youngest person there (44) and by kids are the only ones there. The younger crowd is not exposed to these items and don't have any interest, especially with the prices so high they can't afford it even if they were interested. This pushes them even further away. I don't collect to speculate, I only buy what really interests me and at the right price - which not much of anything lately with the prices being too high. I don't plan to sell, but you always need an exit plan just in case. I just don't see the prices staying or going higher within 5 years. As for the pickers show, I think it has not been good for the hobby as a whole as it has driven the prices up too high to allow entry level people in that have an interest, but not a lot of cash to buy beat up, overpriced stuff. Completely disagree about the impact of Pickers show ...I guess it depends on which side of the fence you're on. Has it caused prices to increase? Sure. For those of us that built most of our collection before that show took off .... that's a good thing. But ... with the increased valuation has also come increased awareness. I've gotten leads on stuff because people notice petro stuff more ... and I believe there's an increased appreciation for our collections from those that don't collect because they are now more aware of the value. Some probably won't want to hear this ... but I get tired of the whining about prices being unaffordable for the 'common man'. It's never been an easy task. I've worked side jobs and bought/flipped cars and petro to buy what I wanted. Rarely have I spent household money to buy. A rising tide lifts all boats. If prices are high ... take some risks in your life, buy out a small collection and flip what you don't need to keep. It can be done. Future of the hobby? Who knows. I personally don't believe it's topped out yet. Like most collectable markets ... it will peak and begin a downward trend. When that happens the good stuff will probably still be good ... the medium to lower end items will take the biggest hits first. That's why you buy good stuff when you can. I have the same thoughts as Ohio Oil about the picker show,knowing its a show that is staged for the audience makes me see through it as just entertainment,but it has brought our hobby to the forefront.Thats a good thing no matter what it does to prices. I don't worry about where its going as my stuff will be passed to my son and grandson, if they sell it ok if they enjoy it ok. I know they don't view it as junk . If your trying to plan a out as some has talked about , buy one quality top notch item as opposed two or three beaters.and ride the waves. I wouldn't worry about the bottom falling out anytime soon if ever. No one has a crystal ball,if I did I would of been collecting long before I started. If I ever stop it will have to reach a point where I don't enjoy it any longer. I don't see that happening.